A visitation honoring Ronald’s life will be held on Wednesday, March 20, 2019 from 2:00 until 3:00 p.m. at the Sunset Ridge Memorial Chapel. Interment will follow in Sunset Ridge Memorial Cemetery. 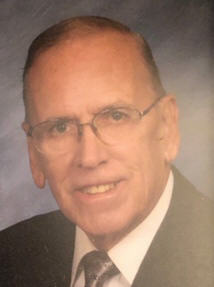 Ronald L. Tucholl, age 90, of Kenosha, passed away on Friday, March 15, 2019 at his home surrounded by family. Born in Kenosha on December 14, 1928, he was the son of the late Rudolph and Lillian (Lloyd) Tucholl. Ronald attended local schools and graduated from Kenosha High School. On August 27, 1949 he was united in marriage at Friedens Evangelical Lutheran Church to Shirley Mae Gitzlaff. Sadly after 60 years together, she passed away on July 29, 2009. He was employed with Simmons, Johnson Oil and then with AMC/ Chrysler for 28 years in the employment office. Ronald was a member of Friedens Evangelical Lutheran Church, enjoyed dancing with his wife and was an all-around handyman. He is survived by his two children, Gary (Shelly Jensen) Tucholl and Kathy (Lanny) Inman; four grandchildren, Stefani Powers, Ryan Tucholl, Jayme Inman and Christopher Inman and four great grandchildren, Zachary and Logan Powers, Talyn and Armahni Inman and Izabela Sanchez. In addition to his parents, and wife, Shirley; he was preceded in death by his sister, Lois Harper and his brother in infancy, Elwin Tucholl.